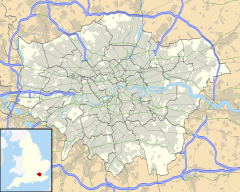 Chingford is a district of the London Borough of Waltham Forest in East London, situated 10 miles (16 km) northeast of Charing Cross. Historically a rural Essex parish, it gained urban district status in 1894, and between 1938 and 1965 formed the core of the Municipal Borough of Chingford. Chingford is close to the Essex border of Epping Forest District. It borders Sewardstone to the north, Woodford Green and Buckhurst Hill to the east and Walthamstow to the south. To the west lie William Girling and King George V reservoirs, known together as the Chingford Reservoirs, and the River Lea. Across these, Chingford is linked with Ponders End through the A110 Lea Valley Road, whilst South Chingford is linked with Edmonton through the A406 Lea Valley Viaduct. To the north lies Epping Forest, the most part of which is in Essex but is maintained by the City of London Corporation.